Please scroll down to see photos and descriptions of our workshops, choose the number of participants and click the ADD TO CART button to register. 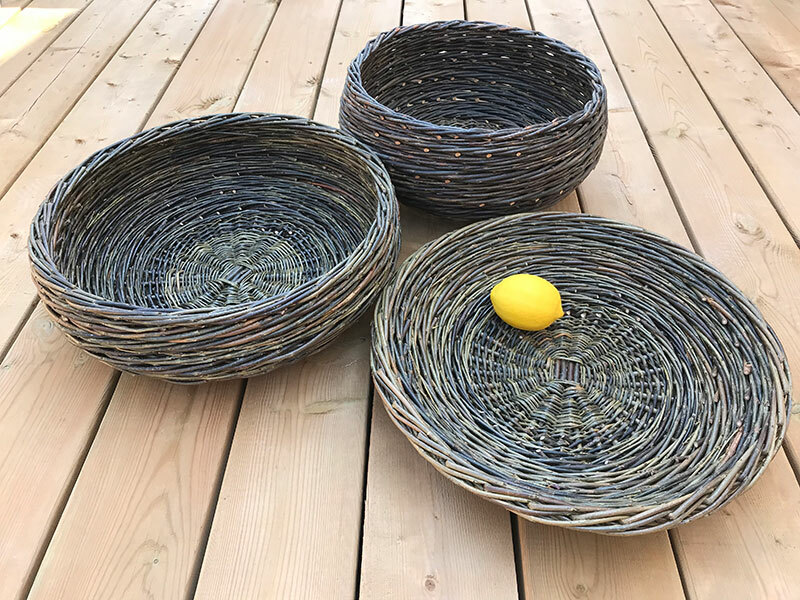 IF YOU CAN PART WITH IT, YOU MAY WANT TO GIFT YOUR WILLOW CREATION TO SOMEONE SPECIAL OR BRING THEM ALONG AND ENJOY THE DAY TOGETHER. All materials are supplied. We will send you an email one week prior to the class with directions and details. Complimentary coffee, tea and Melly Rolls cookies will be served for every class. A catered lunch option by the talented Chef Melissa Smeets at Melly Rolls is available for full day workshops. *Please note, all of these workshops are suitable for beginners. Space is limited and workshops sell out quickly. Please contact us to join our waiting list if the class of your choice is sold out. You will learn how to construct two short hurdle panels for use as garden edging or a feature in your flower or vegetable bed. If you have a design for some garden edging you would like to build, send us a pic. Want more than two? Let us know in advance and purchase materials to take home. Don’t miss out, this workshop is extremely popular! THIS IS A FULL DAY CLASS FROM 9AM-4PM. Please read our cancellation policy before you book. Build your own UNIQUE Peony Crown/Plant Support. A Madame Twig creation, this one-of-a-kind plant support is both beautiful and functional in your garden, outdoor container or even inside your home. A perfect Mother’s Day gift! THIS IS A HALF DAY CLASS FROM 1PM-4PM. Give your largest plants the stately support they deserve when you create this fantastic woven willow collar! This decorative plant support is great for Hydrangeas, Delphiniums, big clumps of Peonies or other tall plants that need a little help staying upright in the garden. Measures approx. 24” diameter by 26” tall. USEFUL FOR SO MANY THINGS! A PLANT SUPPORT, GARDEN FEATURE, DISPLAY IN A LARGE CONTAINER OR ADD A STRING OF LIGHTS AND SOME GLITTERING ORNAMENTS FOR A DIY INDOOR/OUTDOOR WINTER DISPLAY. Everyone wants one! You can have one of these remarkable structures too if you join us on May 18th. Build a big, beautiful obelisk in this fun one day workshop. Height approx. 6 - 7ft. These popular woven willow stars and flowers are back! Build a 30-40” ornament to hang on your porch, fence, shed or even your living room wall! You don’t have room for a big one? No problem, you will have time to create two smaller versions if you prefer. It’s been a while since we have offered this amazing GIANT GARDEN GLOBE and we are sure it will sell out quickly! This is an eye catching ornament with so many uses in and around your home. If you don’t have time for a full day workshop, this class is perfect for you. A great size for climbing annuals, this 4-5ft obelisk will tuck into any space or fit beautifully in your summer/winter outdoor container (it makes a gorgeous Christmas tree with lights strung around it too).